As a concept, sound art has a number of parallel histories. Depending on the creative environment and the country, it is referred to by a variety of names that cover more or less the same range of activities. Sound art has now become a very broad field that includes experimental music, sound sculpture, installation, performance, radio art, loudspeaker installations, electronic art, field recordings, and much more. Sound art is often regarded as an interdisciplinary and intermedial1art form, with the consequence that definitions of what does and does not belong to the field tend to vary. In recent years, many books about sound art have been published, all of which devote a considerable number of pages to defining the phenomenon. Sound art as we know it today is a generic term that covers a range of trends in music and the visual arts that developed during the twentieth century. From a contemporary perspective, the initial seeds of sound art can be traced back to antiquity2and the golden age of Islam,3 as well as to various forms of acoustic mobiles that have been among the artefacts of various cultures since time immemorial. Even so, it is only in the art and music of the modern period that this development has picked up momentum and expanded to become the broad field that constitutes the sound art of today. One fundamental precondition for this development has been the changes to our surroundings that followed the industrial revolution. Within a short space of time, people had to adapt to a soundscape and a pace of life that changed perceptions in ways that would eventually give rise to new artistic forms. In a text introducing a major sound art exhibition at the Center for Art and Media (ZKM) in Karlsruhe in 2012/2013, curator Peter Weibel points out that the introduction of sound into modern art is attributable in particular to the Futurists and their interest in speed and noise. In discussions of the early history of sound art, Futurism is certainly the most frequently mentioned influence. It is always an entertaining exercise to try to define a particular field or practice. With regard to emerging fields, such as sound art, this kind of intellectual game is unusually challenging and produces highly divergent results. Here are a few examples: Some people define sound art as «sound used as material in a visual arts context». In contrast, others argue that any art form that focuses on sound is music, or «organised sound».4 Yet others define sound art more narrowly, limiting it to acoustic installation art. 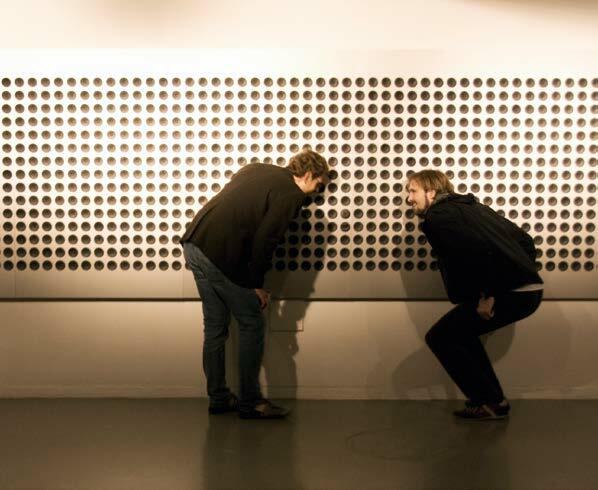 In England, a widely used term is sonic art, which also covers non-spatial forms of acoustic art that employ some kind of play-back technology in order to be displayed / heard. In America, where in the 1970s artists also explored the potential of radio and telephone, the term audio art is used in much the same way. The German term Klangkunst, on the other hand, tends to exclude forms of sound art that lack a spatial or location-specific dimension. Rather than there being a single, universal definition of sound art, it is clear that the term is defined differently depending on the linguistic community and interest group. In Norway, people have tended to use the term lydkunst (sound art) very loosely; Lydgalleriet, for example, promotes activities from right across this vast field. Rather than an art form, sound art is a mode of experience. Rather than an art form, sound art is a mode of experience. As a visitor to such work, one soon becomes aware of how fragile this experience is; the mere conversation or movements of other visitors, or other forms of ambient noise, can effectively cause the art to vanish. In contrast to the sense of sight, which functions just as well even when you run through a gallery, listening requires you to stand still, because the sound of one's own movements always threatens to mask other sounds. In effect, audiences are invited to partake of a slow experience that turns one's own physical presence and that of others into a kind of social acoustics. In a concert hall, the audience's temporal and spatial experience is essentially determined by the composer/performer. In sound art, the temporal and/or spatial aspect of the experience is the responsibility of each individual listener. Sound art has gained impetus from the realisation that neither the concert hall nor the gallery space are ideally suited to certain expressive needs, and that the limitations of these traditional experiential spaces exclude a range of possible artistic forms. In the following, we will consider some of the main trends in sound art and meet a few of its principal exponents. As early as the 1930s, John Cage formulated ideas inspired by Oriental philosophy that still play a part in the contemporary discourse about sound and music. Diverse and fascinating, his aesthetic standpoint broke with tradition in two significant ways that have had far-reaching consequences for the development of sound art. Firstly, he negated the distinction between music and everyday sounds, thus clearing the ground for the use of radical, aleatoric principles at both the conceptual and the performance stages of music-making. Secondly, he played with established presentational arenas such as the gallery and the concert hall while also experimenting with non-traditional locations such as shopping centres, abandoned factories or road junctions. Modes of experience were challenged. One of the many events that Cage and his collaborators staged was a performance of Erik Satie's Vexations in 1963. Ever since Erik Satie's furniture music of the late 1800s, music as a mental state, or as a spatial experience, has constituted a counterweight to earlier ideals of form that emphasised extended sequences of sound based on the development, variation and interaction of musical themes. Satie held the large-scale forms of the romantic era in disdain and wanted to achieve a type of music that was less ostentatious and flamboyant. He sought to nurture the mood of a place by means of background music, with the result that he is often regarded as the father of Muzak. Beside his better known Gymnopédies his desk-drawer composition Vexations has become an iconic work that would prove to have an enormous impact on the development of sound art. In the score of this short and seemingly insignificant piece, he wrote an instruction that is still debated today. It seems to imply that the piece should be repeated – 840 times, to be exact. Why he specified this particular number no one knows, yet many people have taken it seriously and held marathon concerts, with several pianists taking it in turns to play the work over and over again. The most famous of these performances is still the first, in which John Cage, David Tudor, Christian Wolff, Viola Farber, John Cale and several others played for a total of eighteen hours. Although tour-de-force events of this kind are fun and elevate boredom to the level of an artistic statement, the sheer exertion threatens to obscure the deeply meditative intention of Satie's piece. It was probably never performed during his lifetime, but was intended rather as a solitary meditation, a musical mantra, whereby the number of repetitions is not just irrelevant, but a conceptual obfuscation that distracts from the action as such. But whatever the origin and intention of Vexations, Erik Satie facilitated a way of thinking about music that was radically at odds with centuries of tradition in Western art music, and which drew its inspiration from the philosophies and religions of more distant climes. Another composer worthy of mention in this context is La Monte Young, whose compositions are ultimately only completed by the listener's behaviour when listening; for the way one experiences Young's sounds is dependent on one's movements within the space in which they are presented, even though technically speaking those sounds remain utterly constant. His music does not need to change in order to justify its temporal extension; it liberates listeners from their concert seats, leaving them free to experience the work at their own pace and in their own preferred sequence. In exploring this intersection between minimalism and the way we experience sound in non-intentional circumstances, sounds such as ambient and audience noises, Young, Cage and many of their contemporaries were proposing a new mode perception. This is now recognised as one of the main historical contributions to the sound art of today. Spatial experiments and acoustics were central to early sound art. This tradition is especially strong in Germany, where one of today's most important sound artists, Bernhard Leitner, has been exploring the acoustic aspects of architecture and physicality throughout his forty-year career. A highly individual and exceptional artist, he is now seen as one of the pioneers of sound art. In the 1970s he made clothes with built-in loudspeakers; any listener who put on these garments not only heard, but also felt the vibrations from the sound. The sounds and vibrations were «choreographed» to form sound movements between the sewn-in speakers, thus allowing the wearer to experience a kind of vibration dance on the body. 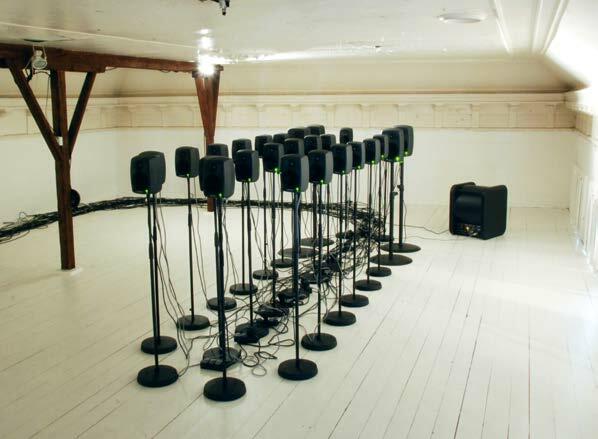 In his many sculptures Leitner has explored the movements of sound and how they relate to the acoustics of a space. The American artist Maryann Amacher's exploration over many years of the relationship between sound and space and architecture, as for example in her Music for Sound Joined Rooms (1980-2002), has had an immense impact on all those who work with sound installations. In her work she sought to dramatise spaces by means of carefully selected frequencies and the precise placing of sound sources. The effect is almost as if the sound image is produced by the space itself rather than by the technical equipment. Since her death, Amacher's work has been continued by dedicated followers. One highly distinctive form of sound art is produced by the German group Audio Gruppe; since the early 1980s, Benoît Maubrey has worked with performances in which performers move sound sources around according to choreographed sequences. Perhaps his best known work is Audio Ballerinas, in which dancers wear costumes with built-in loudspeakers. In this way the sound moves around the space, which is in many cases outdoors. The 1960s saw the emergence of sound ecology, largely through the work of R. Murray Shafer's group at Simon Fraser University in Vancouver. Sound ecology treats ambient sound as a key component of the environment, placing particular emphasis on the sounds of nature. Although sound ecology has traditionally been sceptical towards urban soundscapes, in recent years it has also incorporated urban and manmade sounds. There is a long tradition of considering the sounds of one's surroundings as a valuable acoustic resource in itself (Cage's 4:33 is an important milestone in this respect), and several types of artistic practice have sprung from this focus. By shifting the focus onto ambient sound, the composition process loses its central significance, thus undermining traditional, mytholgised views of the artist's role. What the artist seeks to do instead – to adapt the words of Duchamp – is draw attention to sounds that are already there and to point the listener in a certain direction, rather than to produce new sound. Today, the term «field recording» refers not just to a certain type of sound material, but also to a genre of sound art. Several record labels have specialised in releases of this kind and many artists build their works around recordings of various environments. One of the first and most important initiatives that worked with this approach was the World Soundscape Project (WSP), whose album The Vancouver Soundscape from 1973 triggered a global movement that began presenting soundscapes from every imaginable location, whether familiar or unfamiliar, as ready-mades. The so-called «sound walk» arose almost simultaneously in Europe (Cardew / Fluxus), New York (Cage / Neuhaus / Corner) and the aforementioned Vancouver (Shafer / Truax). Today the term «sound walk» signifies a broad array of different types of non-stationary listening experience, usually outdoors. In its traditional form (audio / listening guide), a sound walk involves a group of people coming together and following a route in silence while listening with heightened attention to their surroundings. At the end of the walk the participants discuss their perceptions. In another kind of sound walk, the organiser will have placed sound sources along the route, some of which might be musicians or other artists. Yet another form involves the use of maps / GPS, a listening map, often together with texts / photos that can be either descriptive or poetic. In 1991 Janet Cardiff presented the first of her Walks. In these works she augments reality by means of sound played back over headphones to people who are invited to follow a specified route. The headphones she uses are of the open type, so that the audience also hear the world around them. This quickly became a popular form of presentation for many artists, and is still widely used. By providing the audience with headphones outdoors, one can guide them to specific listening posts, and the artists can add sounds and soundscapes to the recorded material that is played back in the headphones. The result is a form of augmented reality that mixes the sounds of the real world with pre-recorded material. Christina Kubisch has made it her speciality to provide alternative listening options to those of our everyday surroundings. With specially designed headphones that transform electromagnetic signals into audible sound, she enables us to hear the radiation that is all around us. Her sound walks tend to focus on escalators, transformer sub-stations and places with many wireless networks. This is something very different from the traditional sound-ecological walk. A number of initiatives around the world work to map soundscapes, mainly in cities, locating individual sounds on interactive maps that can be accessed online. The proliferation and increased availability of recording technology, GPS and the internet has also promoted the sound map as an important phenomenon. A number of initiatives around the world work to map soundscapes, mainly in cities, locating individual sounds on interactive maps that can be accessed online. Large quantities of audio files are uploaded by means of crowd-sourcing and the use of various geo-tagging apps for mobile phones. In terms of both background and approach, Harry Bertoia represents something very different. Originally from Italy but now living in Pennsylvania, he started out as a sculptor and furniture designer. His chair designs for Knoll are now considered modern classics. In 1960 he began to use the money earned from his contract with Knoll to create various types of Sounding Sculptures or Sonambient, as he called them. These were metal sculptures whose design was largely determined by the timbre, tone and sound quality of the constituent materials. He produced hundreds of these sculptures, occasionally using them in concerts, and released ten LPs featuring their sounds5 which have since become highly-prized collectors' items. His works have inspired several generations of artists and been purchased by numerous public and private collections and museums. One artist who has received far less attention than he deserves is the German Peter Vogel, who has been producing interactive electronic sound sculptures since the 1970s. As in the works of Bertoia, form and function are inextricably linked in Vogel's sculptures, almost to the point of functional purity; all the visible parts of his sculptures serve functions that are supplementary to the merely visual or conceptual – small electronic components with their colour codes, copper wires, soldered contacts, small loudspeakers, all meticulously assembled into extraordinary sculptures that invite close contact. When approached close up, these works become even more remarkable in that they turn the viewer's movements into the various components of music. Repetitive and minimalistic, the music that emerges from the naked loudspeakers is a nod of homage to electro-gurus such as Kraftwerk and Claus Schulze. Here the viewer controls a variety of analogue synth sounds, arpeggiators, simple drum-machine rhythms and filters by means of his movements, which are picked up by light sensors. Vogel's sculptures are elegant and playful, ingenious and highly imaginative. They have played a decisive role in the development of kinetic art since the 1970s, and have inspired more than two generations of sound artists and sculptors. In Paris in the 1950s, the Baschet brothers built remarkable acoustic instruments with spectacular shapes in steel and glass. These were primarily intended for use in concerts, and it was only after they were purchased by and exhibited at MoMA in New York that a wider audience began to appreciate their sculptural qualities. The works of the Baschet brothers' were only one manifestation of a rapid development of instruments and audio equipment that occurred simultaneously in all corners of the world from around 1910 onwards. After World War II, synthesisers of every conceivable shape and size were developed and produced, using one intricate and ingenious method of synthesising after the other. Some of these found their way into the realms of visual art and theatre, while others were used for music. Today's device art and interactive sound sculptures are descended from this practice. Fundamental to one particular tradition in device art is the solenoid, an electronic component that can be used to knock on different objects. Entire automatic orchestras have been built on this principle, while in recent years a DIY culture of guerrilla street art has also emerged that involves attaching activators to various resonant objects (such as street signs, glass windows and rubbish bins) in streets and shopping centres as a way of creating temporary sound installations or performances. Device art consists largely of art that could be presented in a technical museum just as readily as in a gallery. 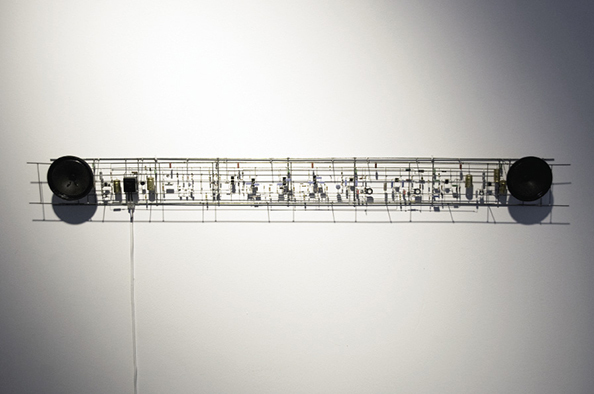 With the automata and other «useless» inventions of past centuries as the backdrop, sound-producing device art is regarded today as a form of sound art. Martin Riches and Erwin Stache are two artists of long experience who have produced a significant body of work. Device art frequently explores physical phenomena, such as vibrations, oscillations, pressure, magnetism, and electricity. At the same time, a distinct art movement, generally referred to as «art-science», has emerged. This makes a feature of the phenomena of physics, often by employing them to bizarre or humorous effect. Examples of this kind of art that emphasise the sound aspect include Alvin Lucier's Music on a Long Thin Wire and I Am Sitting in a Room, and Laurie Andersons Handphone Table. Stephen Vitiello has made it his trademark to work with the physical movements of isolated loudspeaker components, even when they no longer produce sound. What concerns him is the movement as such, or the effects of movement such as «loudspeaker pressure». The development of the gramophone and later of the tape recorder made it possible to compose music without recourse to either instruments or notation. The first electronic musical instruments were developed at around the same time. These two technological innovations added whole new universes of sound to the composer's toolbox, and set the stage for entirely new approaches to both composing and performing music. The upshot was a distinct tradition in music generically referred to as electronic music, which covers everything from noise music and musique concrète to modern electronic dance music. As a performance practice, playing recorded sound back through loudspeakers enabled people to overcome their limitations as performers. Not only was it possible to push sounds to new extremes of loudness and pitch, artists also discovered a new realm of spatial and temporal opportunities. If one wanted a sound to come from above, there was no need to suspend a flautist in a trapeze above the audience, one could simply hang a speaker there. And if one wanted a concert to last for seven days instead of just an hour, all one needed to do was play the recording in a loop. It was only a short step from this kind of arrangement to speaker installations, and artists were not slow in adopting these new means of producing sound. The first large-scale speaker installation was developed by Iannis Xenakis for Le Corbusier's spectacular «Philip Pavilion» at the World Expo in 1958. With its 425 loudspeakers, it was used to perform Edgard Varèse's Poème électronique Speaker installations have become a distinct genre of sound art, and are sometimes presented in darkened rooms with large arrays of speakers (anything from sixteen to several hundred), arranged in carefully calculated matrices. When working with sonic art forms, the space in which they are presented is often an integral aspect of the work. The space is effectively the instrument for the work and serves as its primary resonance chamber. Audiences encounter the work within and through the filter of the space. Built for silence, museums and large gallery spaces tend to amplify and prolong even the tiniest sound. The echo can seem like a humiliating reprimand to anyone who dares to make a noise. This is a kind of authoritarian acoustics that presupposes silence within its realm, as if to say: «When contemplating art, silence is the only legitimate response.» Although many galleries and museums have since modified their acoustics to be less noisy, servility remains evident in people's behaviour – which, with its reticence and whispering, tends to reflect a respect almost for something sacred. In this kind of setting, sound-based art forms are essentially rebellious, whether or not they intend to be so. Sound works can easily seem like badly behaved and unruly children in a church, shushed by others and eventually dragged out by embarrassed parents. Sound works can easily seem like badly behaved and unruly children in a church, shushed by others and eventually dragged out by embarrassed parents. As mentioned in the introduction, over the past sixty years sound art has developed into a very broad field that includes a diverse palette of techniques and practices. Even so, it is only just beginning to figure in major collections and biennials. One possible reason for this is that it is almost unsellable, yet at the same time very expensive to produce; it is site specific and demanding in terms of space, yet physically sensitive; it is often tailored to a specific location, and can rarely if ever be «taken into the living room». Never before has there been such extensive use of sound in the world of art, but at the same time, the skills and knowledge needed to promote sound art in traditional museums and kunsthalls are still in short supply. For this reason, the medium remains reliant on a small group of dedicated practitioners who understand its special requirements. In recent years, this group has expanded rapidly, while more and more festivals and galleries have begun including sound art in their programmes. We can therefore look to the future with hope.